In 1990, the Teenage Mutant Ninja Turtles were a media powerhouse. If you could slap the name "Teenage Mutant Ninja Turtles" on it, it was guaranteed to sell. Especially cereal! Back then, cereal prizes actually were prizes. You got some amazing things for free in your boxes of sugar and marshmallows. However, the TMNT cereal had something SO amazingly freaking awesome, it couldn't fit in the box! 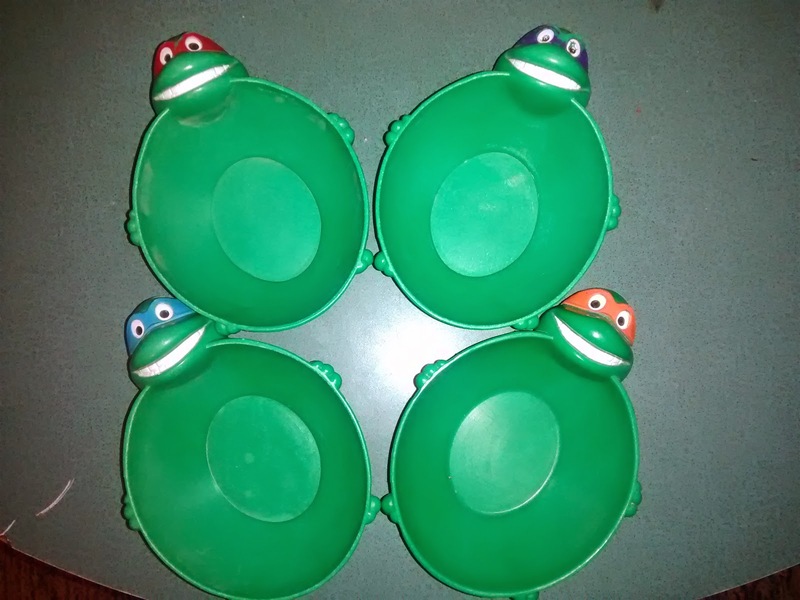 With each cereal, wrapped in cellophane, came an individual bowl of one of the four Turtles. This was a guaranteed way to not only sell cereal, but to sell multiple boxes of cereal at once. I remember demanding that we buy four boxes to ensure we were able to complete the collection instantly. My mom, an enabler of my nerdy needs, grabbed the boxes, and we took them home. The amazing thing about these bowls in the picture is that those are not re-releases, or recently found bowls. No! Those four bowls are the ORIGINAL bowls that I owned in 1990. They have even survived use from my own children, which is a real testament to the "prizes" that we got in our cereal back in the 80's and 90's.